The Premier League’s mid-week fixtures were a lesson in context. Manchester City’s loss to Newcastle gave Liverpool the opportunity to extend their lead at the top of the table to seven points, but instead they drew against Leicester. Had both they and City won, the atmosphere probably would have been better despite Liverpool’s lead being greater in how it actually played out. A few days later City win against Arsenal while Tottenham ground out another win to put themselves back in the title race, leaving Liverpool under pressure. Both Jurgen Klopp and Manuel Pellegrini opted for 4-3-3s, although the nature of the game made them look very different. West Ham came into this game primarily looking to defend and did a far better job than they did in August. The back four stayed deep and narrow, denying Liverpool’s forward trio space to work in or run in behind. This left space in the wide areas, where Andy Robertson and James Milner would get high and wide. 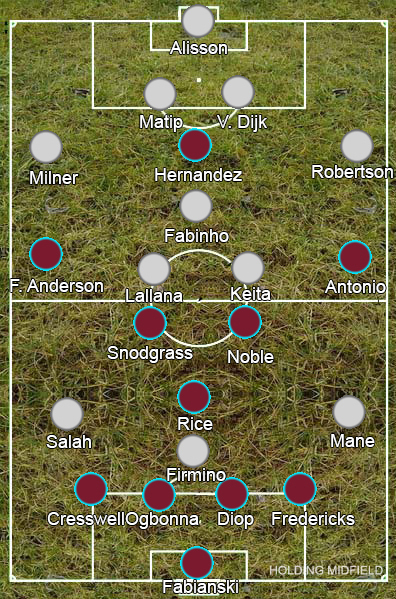 Rather than have Aaron Cresswell and Ryan Fredericks come out and meet the pair, giving Liverpool’s forwards more space in the middle, Felipe Anderson and Michail Antonio would track all the way back, forming a back six that made it very difficult to break West Ham down. Ahead of them, Javier Hernandez would block the ball into Fabinho, while the midfielders would cover the centre. Mark Noble and Robert Snodgrass would often move up quite high, close to Hernandez, whether that be to get close to a Liverpool midfielder or close down a centre-back, while Declan Rice would cover behind them, with the other midfielder tucking in alongside him. This made it quite difficult for Joel Matip and Virgil van Dijk to play passes through into the forwards, limiting Liverpool’s opportunities to get at West Ham’s backline. Although West Ham defended well, Liverpool didn’t help themselves. With the full-backs unable to stretch play, creativity had to come from the midfield. Klopp went for an attacking line-up, yet it still didn’t work out. With Hernandez shadowing him, Fabinho saw little of the ball while neither Adam Lallana nor Naby Keita looked match-sharp. Lallana is still slowly regaining fitness after an injury-stricken campaign, but why Keita looked so far off the pace is more of a mystery. Maybe he’s struggling with an injury we don’t know about, maybe the lack of a winter break has caught him out in his first year in England, or maybe he’s simply lacking confidence at the moment as he struggles to adapt, but regardless of the reason this was one of his worst performances in a Liverpool shirt. It must be said, he did brighten up towards the end of the game though, passing much quicker and dribbling forward. As a result, Liverpool moved the ball quite slowly and Liverpool’s attacking trio never found much space between the lines. Liverpool’s best moments came when Sadio Mane or Roberto Firmino dropped deeper to try and create something themselves, but them leaving the frontline didn’t exactly solve the problem of how they were meant to break down a six man defence. They did take the lead, but this was very fortunate: Lallana pulled off a great little turn, however Milner was clearly offside and, even then, Mane only really found the space to finish the cross because Issa Diop slipped. West Ham soon leveled through a set-piece. Liverpool trying to maintain a high line made it very easy for Antonio to make a run into the box, outnumbering and outmuscling Keita at the near post as Noble held him back. Although spending most of the match defending, West Ham often threatened Liverpool with counter-attacks. Milner simply doesn’t have the pace to get back from his high position once Liverpool lost the ball, forcing Matip or a midfielder across into wide areas that leaves space in the middle to exploit. In the second half, he didn’t get quite as high in attack, meaning he wasn’t left as exposed when defending. He’s been unlucky in that his two games at right-back have been against particularly tough opponents in Wilfried Zaha and Felipe Anderson, but the decision to let Nathaniel Clyne leave in January looks even worse than it did at the time, especially now that Joe Gomez needed surgery on his fracture. Liverpool didn’t really have any answer to the problems West Ham posed. Klopp made attacking substitutions, bringing on Xherdan Shaqiri and Divock Origi, however Liverpool’s attacking patterns didn’t really change. Maybe Klopp could have moved the full-backs inside to stop Antonio and Felipe Anderson tracking back, and had Shaqiri and Mane hug the touchline to stretch the back four, but the problem would still remain of who joins the attack in the centre? The question of who provides the creativity from the centre in Alex Oxlade-Chamberlain’s absence has been a problem for Liverpool all season – injuries to the defence have aggravated the issue, causing the dip in results, but if Liverpool were able to easily break down deep defences, they would probably have a larger lead than the three points they currently have.